Homeschool dads involve themselves in their children’s lives. Providing the income so that your wife can teach the children is one way. Fathers can also use their unique skills and interests to teach their children. Men usually complain that they do not have time to teach. But education is more than academics. Dads teach about their faith. Fathers can teach their families about their hobbies and interests. If your husband lacks ideas have a talk with him. Together you should come up with some ideas where he can be involved in his children’s education. Below are ideas where men can help with schooling. Each family is a little different and will have different ideas. I feel that spiritual involvement is one of the most important ways a dad can lead his family. It is important to teach our sons and daughters to live Christian lives. At the very least dad should pray for his family. When he has times he can lead family devotions. Read stories from a children’s Bible or verses from the Bible. There are also family devotional books that you can buy. We have used several from Doorposts. We all have hobbies and interests that we would like to pass on to our children. When we do fun activities with our children we build relationships with them. Oftentimes men are responsible for outside chores and home repairs. Children can learn a lot when they help around the house. My son’s have learned to garden and do yard work by helping dad. One son has also learned how to change the kitchen faucet. Car maintenance is another skill that can usually be taught by men. For men who have the time let them teach. Some fathers are good at math. Others are good with science or technology. Let your husband teach subjects that he is good at or has an interest in. Even if your husband does not have the time to teach a full-time class he can be involved with academics. Here are some ideas. Go to museums with you and the children on the weekends. Watch documentary videos with the family. Read biographies of famous people to the children. Read historical novels to his children. Take his family to historical reenactments. Do experiments with his children. Help his children identify birds, insects, animal’s footprints, or plants. Help his child build a telescope. Help his child set up an aquarium. Teach your child how to measure a room that needs painted. Build a tree house together. Go geocaching and learn about GPS. For language arts homeschool dads can read to their children. Boys can become better readers when they see men in their lives reading. So mom let your husband choose books to read that he finds interesting. Some dads have jobs where a child could visit for day or part of a day. Or maybe you could take a field trip to the office. Your child could benefit from seeing what your husband does at work. Most children would jump at the chance to do something with dad. 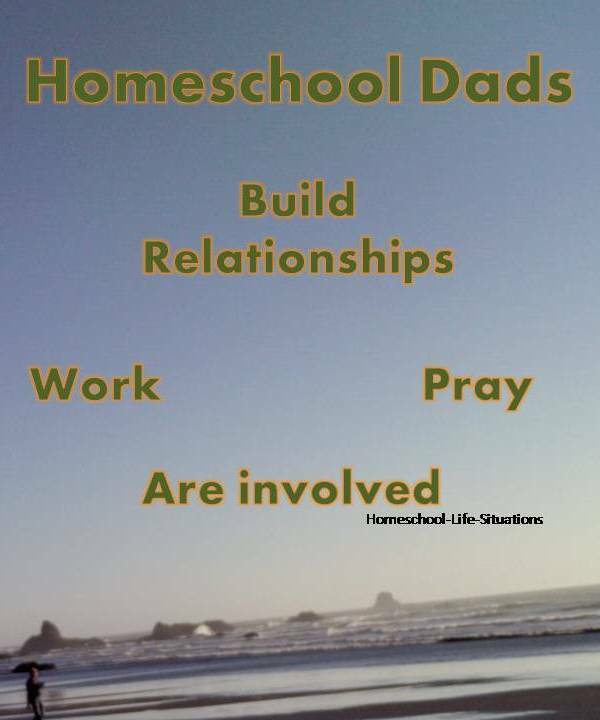 Homeschool dads can be involved in sharing their faith and interests. When they have time they can help teach academics.